Soneva Fushi and Soneva Jani are synonymous with the Maldives, embodying all the reasons people travel to the destination in the first place – luxury, relaxation and jaw-dropping scenery. Where they transcend the destination’s median offering is in their unique and exceptional castaway-chic aesthetic. Thanks largely to the creative genius of Eva (one half of the famous husband-and-wife duo behind Soneva), the resorts are designed to both complement and protect their natural surroundings. Constructed using native materials and paying homage to local ecosystems, these properties have become the zeitgeist of sustainable luxury, without compromising on comfort or attention to detail, and have been much celebrated and lauded for their design. They are regularly featured in the annual Conde Nast Traveller Readers’ Choice Awards and Gold List, along with each resort receiving a number of other prestigious accolades such as the ‘World’s Sexiest Bedroom’ title. Clearly, the brand has captured hearts around the world with its unique aesthetic. Boasting private beach access and blending seamlessly with the island’s swaying palms, all 59 villas ooze idyllic deserted island vibes and promise privacy and seclusion. Externally, they’re a study in voluptuous curves hand-crafted from whitewashed wood, with shingled roofs and understated architecture that allows the natural environment to shine. Internally, they’re sophisticated, spacious, soothing and replete with cosy corners and hammocks to curl up in with a good book. An interior palette of greens and purples channels the surrounding Indian Ocean seascape, while furnishings made from all-natural materials such as wood, cotton and wicker are a constant reminder of the Soneva brand ethos. With private pools, stunning outdoor bathrooms featuring sunken bathtubs and rainforest-shrouded showers set in an enclosed garden area, the villas at Soneva Fushi are as aesthetically pleasing today as when the resort first opened. Wall-to-wall windows, whitewashed wood, sandblasted pine floors, white rattan furniture, decorations fashioned from driftwood or rough marble slabs, and sunken sofas with hand-dyed cotton cushions from Sri Lanka, culminate in a picturesque setting. Some villas feature sundrenched lounge areas, walk-in mini-bars with espresso machines and personal wine cellars, lavish dressing rooms and sprawling roof decks, and many of the overwater villas also boast curved slides that transport guests directly into the lagoon below. Thoughtful details such private plunge pools adorned with catamaran nets and open-air bathrooms create an ambiance that matches the resort’s tranquil setting. 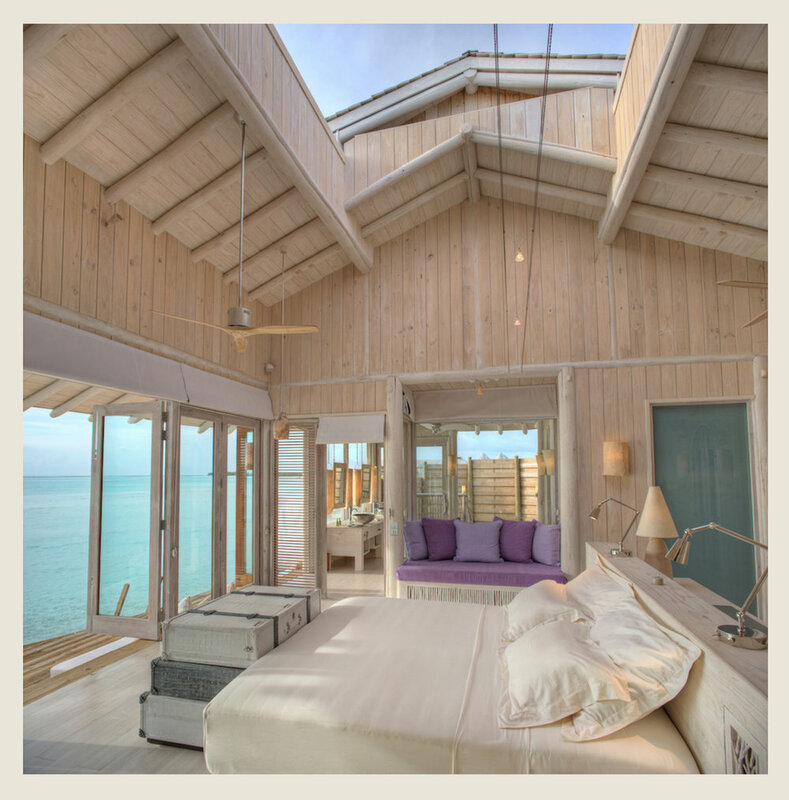 The standout feature of the water villas, however, is the retractable roof over the master bedroom, which can be drawn back in the evening for a truly one-of-a-kind stargazing experience from the comfort of bed. 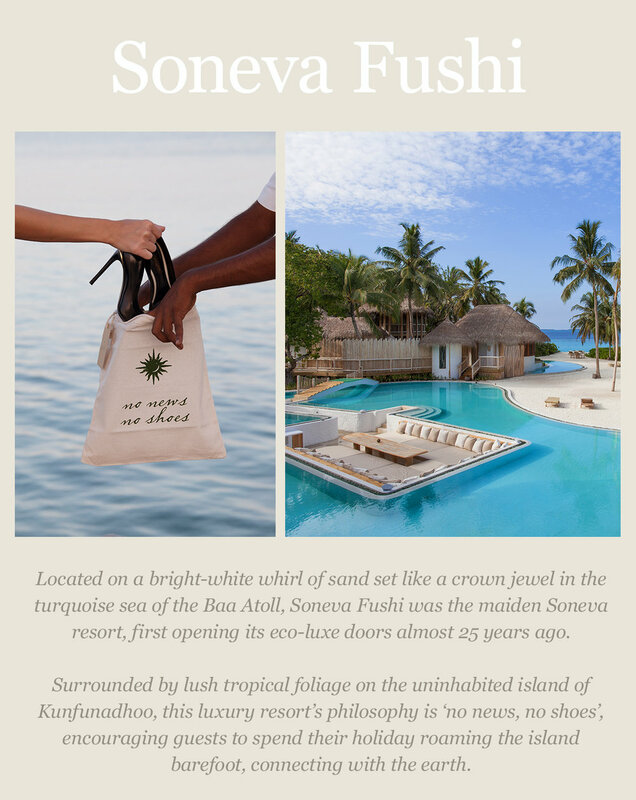 Addicted to Maldives have some very exclusive offers for Soneva Fushi and Soneva Jani. Contact our team to make your way to your favourite Soneva Maldives Luxury Resort.